Need a new recipe to include in your rotation of holiday munchies? I’ve got just the one for you! Union Square Café’s Bar Nuts are warm, healthy, addictive, and best of all, quick & easy to make. You will definitely impress your guests. The Union Square Café is a long-running New York City restaurant and the nuts they serve in their bar are famous. Google them and you’ll find the recipe on many different sites from Epicurious to Saveur, but only one, The Smitten Kitchen, has you return the nuts to the oven for a final bake after tossing with the butter-rosemary mixture. This makes all the difference! Because I’m not a big rosemary fan, I was skeptical of this recipe at first, but Deb at the Smitten Kitchen assures that even the rosemary-averse will love it here and I wholeheartedly agree. I’ve made these twice, the first time with all cashews and the second with cashews and almonds. I liked both equally well when they were warm, but when eating at room temperature, I prefer the cashew only version. If you use mixed nuts, keep in mind some of the nut varieties will get over-toasted before other nuts are just right. That’s the reason I stuck to cashews and almonds, which take the same amount of time. Stock up on nuts, you’ll be making these several times over the holidays for all your gatherings and you can also package them in small jars for gift-giving. Enjoy! Preheat oven to 350 degrees F. Spread nuts on a sheet pan and toast for 7-15 minutes (raw nuts will require the longer cooking time, already roasted will take less). Meanwhile, in a large bowl, whisk together the melted butter, rosemary, cayenne, brown sugar, and salt. Once the nuts are toasted, dump them in the bowl and stir to evenly coat. Return the nuts to the sheet pan and spread in an even layer. Bake another 5-10 minutes. Cool for a few minutes and serve warm. The nuts are also good at room temperature or reheated for 5 minutes at 350 degrees F. Store leftovers in an airtight jar. Makes about 3 ½ cups. The cooling temperatures, shorter days and changing leaves have got me craving soup. A fall soup, of course! 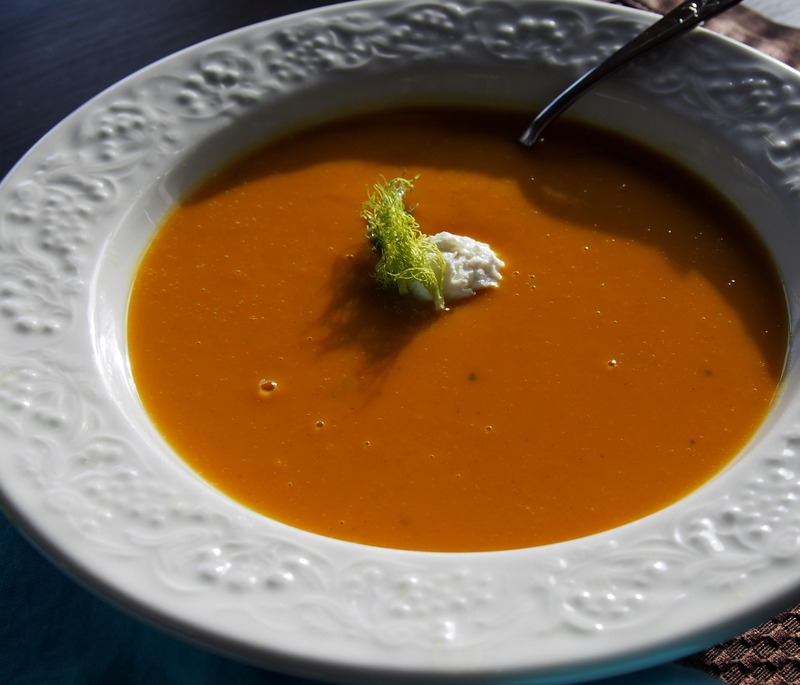 In years past squash soup has been my go-to when the chilly weather arrives. Thinking I might switch that up a bit, I considered a beet soup, but then I spied some beautiful sweet potatoes at the farmers’ market. Decision made! This soup was our first course when Pete’s parents came for lunch last weekend. It was so good, I had to cook up another batch for this week’s lunches and added a little kick with cayenne pepper, making a really good soup downright fabulous. You can vary the amount depending on your heat preference, or leave it out altogether if you prefer. Topping off the soup Monday was a little dollop of Greek yogurt and fennel fronds. Today, I threw in some leftover cooked wild rice before I heated it up and it was a great combination. Use your imagination or just have the soup plain, regardless, the flavors will be like a warm blanket snuggling you through the change of seasons. Enjoy! Heat oil in stock pot over medium heat. Cook onion until it starts to soften, about 3-5 minutes. Add curry and cayenne and stir, cooking for about 30 seconds, until spices are fragrant. Add sweet potatoes and vegetable broth. Bring soup to a low boil and reduce heat and simmer for about 20 minutes, until sweet potatoes are tender. Turn off heat and blend soup, using an immersion blender, until completely smooth and velvety. Add coconut milk and stir to combine. Taste and adjust seasonings. Serve garnished with a small dollop of Greek yogurt and fennel fronds and/or mix in some cooked wild rice for a more filling soup. Makes about 6 good size servings.